The present oratory dates its beginning to Christmas, 1998, when Most Rev. Joseph Perry celebrated Christmas Mass there. How did it come into being? In the early 1990s, Angelo Ciambrone of Chicago Heights heard citizens of the city lament the loss of their church, their parish, and their community. He interceded on their behalf with the Archdiocese of Chicago and ultimately, with the highest court of the Catholic Church in Rome, the Rota. Elected in 1995, Mayor Ciambrone went to Rome five times; city corporation counsel, August Anzelmo, also went there. Every Catholic who disagrees with a decision of his bishop has a right to appeal that decision to a higher court. This right of the baptized is guaranteed in canon law. In 1995, a new vicar was appointed for Region VI of the Archdiocese, which includes the southern suburbs of Chicago. Most Rev. George Murry, S.J., was sympathetic to those who wanted their church community back. He then requested permission from Cardinal Bernardin, at the time still the Archbishop of Chicago, to grant these people what they asked: a new church building, constructed at their expense. Before he died, he granted this permission. Most Rev. George Murry, who as vicar of Region VI, the southern suburbs of Chicago, got permission to rebuild St. Rocco as an Oratory. To him be enduring thanks and praise. Why did Cardinal Bernardin do this? It's always difficult to ponder someone else's motives. However, in this case, it may be useful to consider the question. Perhaps he wished to leave behind a legacy of kindness; he was known for this virtue. Such a motive would make sense. As the vicar general, Most Rev. Raymond Goedert, formulated the reasons for the oratory, two were given: pastoral care for Italians and devotion to St. Rocco. Neither reason, as such, is convincing to everyone. For example, most Italian Americans in this community speak English as their first language and do not live in the immediate vicinity of the property; they are of the third and fourth generation. Also, it seems doubtful that many of them really want to build a chapel or oratory out of their devotion to St. Rocco. Both reasons were formulated by lawyers, including Most Rev. Raymond Goedert. (Both he and the current regional vicar, Most Rev. Joseph Perry, are canon lawyers.) At least formally, however, these two reasons were said to be sufficient. In the end, what's important is to win your case. In the end, contrition and pastoral concern, even if belated, won the day. In the end, whatever is for the "good of souls" is normative. In fact, the fundamental reason for the existence of the San Rocco Oratory may well be the nature of the church community. In large part, these are people who know each other by name, who share many elements of their heritage, who have a living family of faith. They also have the numbers, the financial resources, and the leadership to make a vital community of sacramental life. These people also are genuinely hospitable, welcoming all who come to St. Rocco to pray, to celebrate, or to eat. Now, that's Italian! Good people can differ in their pastoral judgment; that's normal and natural in the life of the Church. So it has ever been. What is important now is to live in the present and look to the future. In the present, both our current bishop, Cardinal George, and our vicar, Most. Rev. Joseph Perry, have consistently been supportive of the oratory, in every way. They have visited the community, prayed with us, and given proper, episcopal leadership. In the future, we can look forward to many years of vital parish life, in communion with the Catholic Church. 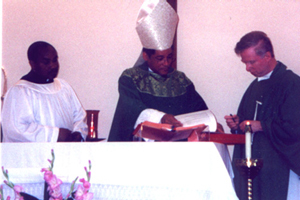 July 2, 2000: Installation Ceremony at St Rocco. (from left:) Livingston Combo, Most Rev. Joseph Perry, Father Gilligan, the new rector of the San Rocco Oratory. Angelo Ciambrone, Mayor of Chicago Heights, here leads the assembly in rejoicing, over at the Mt. Carmel Club, immediately after the installation.